In the beginning was the Word, and the Word was with God, and the Word was God. He was with God in the beginning. All things were created through Him, and without Him nothing was created that was created. In Him was life, and the life was the light of men. The light shines in the darkness, and the darkness has not overcome it. There was a man sent from God, whose name was John. This man came as a witness, to bear witness of the Light, that all might believe through Him. He was not the Light, but was sent to bear witness of the Light. The true Light which gives light to everyone was coming into the world. He was in the world, and the world was made through Him, yet the world did not know Him. He came to His own, and His own people did not receive Him. But as many as received Him, to them He gave the right to become children of God, to those who believe in His name: who were born, not of blood, nor of the will of the flesh, nor of the will of man, but of God. Many biblical scholars note that perhaps John was incorporating the Greek philosophical background of the “word,” or in the Greek “logos,” into his prologue. Any in-depth commentary on the Gospel of John will include comments on this subject. However, for the purposes of this lesson, I’ll leave that area to the experts and explore an avenue we can more readily see and that is John’s description of Jesus as, “the Word” harkens back to God’s word in the Old Testament. In the Old Testament, God’s “Word” is His powerful self-expression in creation (Genesis 1:3ff; Psalm 33:6), wisdom (Proverbs 8:22-36), revelation (Jeremiah 1:4; etc.) and salvation (Psalm 107:20; Isaiah 55:10, 11). Many others passages could be cited but these will suffice to prove the point. So, according to John, God the Father’s ultimate self-disclosure, the bodily fulfillment of His “Word” from times past, then is in the person of His Son, Jesus the Christ who has come to reveal the Father to us through His incarnate person (cf. v. 18; John 14:8, 9; Colossians 1:15; 2 Corinthians 4:4, 6; Hebrews 1:3). In our Lord’s own words, “Whoever has seen Me has seen the Father” (John 14:9). God – Understood as God the Father since Jesus is His “only son” (v. 14). He is the “only God” (v. 18) who desired to reveal Himself to humanity through Jesus, so that we might “believe in His name” and receive “the right to become children of God” (v. 12). Together, God the Father, along with His Son Jesus and the Holy Spirit are one and form the triune God (cf. v. 1; Genesis 1:26; Matthew 28:19). We will return to the subject of Jesus as divine in a later lesson. If you would like more on this subject of the Godhead/Trinity my good friend Ethan Longhenry has a couple of lessons that would be most helpful: The Godhead and God’s Divinity in the Creation. John – While John the Baptist is mentioned in vv. 6-8, let’s wait until a later lesson to expound upon him and his work as “witness,” or forerunner, of Jesus, the Word. In the opening lines of his gospel, John sets forth to introduce the great truths and themes which we will continually visit throughout our study, such as: Jesus’ eternal nature (vv. 1-3), Jesus incarnate (vv. 4-5), the work of John the Baptist as the forerunner of Jesus (vv. 6-8), Jesus’ rejection by His own people (vv. 9-11), the saving work of Jesus (vv. 12-13) and the glorious Jesus (vv. 14-18). Over the many lessons of our study we will explore the richness of each of these topics. Each of the four gospels starts with some kind of beginning statement (cf. 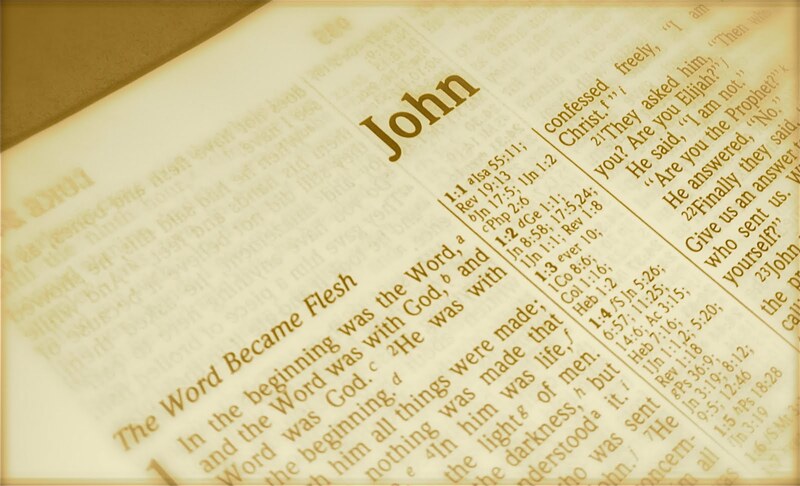 Matthew 1:1; Mark 1:1; Luke 1:1, 2), yet John goes back farther than the rest to the very beginning, or you might even say before creation, “In the beginning was the Word, and the Word was with God, and the Word was God. He was in the beginning with God” (vv. 1, 2). John then traces the story of Jesus from before the beginning down through the ages to His incarnation. While we are here under this heading let’s take a moment to say a word about when/where John wrote his gospel. Many bible scholars date the writing of John’s gospel to sometime between 80-90 A.D., though others would put it at least a decade earlier and more in the time-frame of the composition of Matthew, Mark and Luke. Furthermore, early church history states John wrote this work at the city of Ephesus, where tradition holds he lived out the later years of his life. From John’s own words we learn why he wrote his inspired gospel, “Now Jesus did many other signs in the presence of the disciples, which are not written in this book; but these are written so that you may believe that Jesus is the Christ, the Son of God, and that by believing you may have life in his name” (John 20:30, 31). “Believing that Jesus is the Christ” was the purpose 2,000 years ago and it is still the purpose today. What Jesus taught and what He did are tied inseparable to who He is. Although Jesus took upon Himself full humanity and lived as a man, He never ceased to be the eternal God; creator and sustainer of all things and who has always existed. This is the foundation of all truth about Jesus. When Jesus, the God-man, “became flesh and dwelt among us,” He became the perfect teacher – showing us how God thinks and therefore how we should think (Philippians 2:5-11); the perfect example – He shows us how to live godly lives and empowers us to live that way (1 Peter 2:21); and the perfect sacrifice – Jesus came as a sacrifice to satisfy the Father’s wrath against humanities’ sins (Colossians 1:15-23). Therefore, the entire focus of our lives must be, Jesus the Christ, the Word of God. Blessed Father, thank you for sending our Savior Jesus. As we closely examine the life and teachings of Your son, strengthen our faith to see Him as Your perfect Word. And as Your children Father, fill our hearts with our Lord’s light, grace, truth and life. So that in eternity we might bask in Your glory. Amen.